The Jews then disputed among themselves, saying, “How can this man give us his flesh to eat? So Jesus said to them, “Truly, truly, I say to you, unless you eat the flesh of the Son of man and drink his blood, you have no life in you;  he who eats my flesh and drinks my blood has eternal life, and I will raise him up at the last day. For my flesh is food indeed, and my blood is drink indeed. He who eats my flesh and drinks my blood abides in me, and I in him. As the living Father sent me, and I live because of the Father, so he who eats me will live because of me. This is the bread which came down from heaven, not such as the fathers ate and died; he who eats this bread will live for ever.”  This he said in the synagogue, as he taught at Caper’na-um. Jesus has made the point repeatedly that He is saying that one must eat His real Body (see John 6:16-51). When the Jews question His meaning, Jesus cranks up the Truth in an explicit way and says “Truly, Truly…” When Jesus repeats Himself, pay attention. Jesus then confirms in very clear and strong language that those who wish to have life must “eat My flesh and drink My blood”. In fact the Greek word, trogo, which is translated as “eat” is actually more accurately translated as “gnaw” or “chew”; this word is never used figuratively in the Greek. When Jesus says “drink My blood” He is saying something that the Jews would find unacceptable with their worldly understanding, for consuming blood was forbidden (Lev 17:14; Deut 12:23) for the blood was considered to have life power. He didn’t mean “figurative” blood and the Jews didn’t take it that way. The Jews say, “This is a hard saying, who can listen to it?” If Jesus was just being figurative, or metaphorical, the Jews would not have been so upset. The Jews “get” what Jesus is saying, and they don’t like it. After that “many” of the disciples no longer follows Jesus. These former disciples did not leave over a figurative statement. Many Christians, including all Protestants and many Catholics, don’t believe that the Eucharist is the real Body and Blood of Jesus Christ. They want to believe that despite the multiple times that Jesus says it really is His Body and Blood, that somehow Jesus was talking figuratively. This doesn’t square with the facts: the Jews of Jesus time were very offended and left Him in droves. 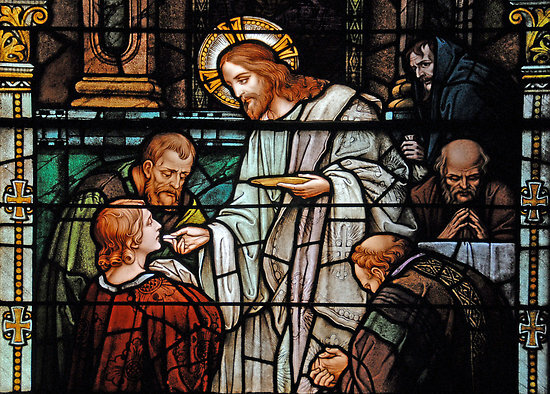 Those who refuse to come to the Church to partake in the Eucharist are in a very real way acting just like the many false disciples who turned away from Jesus. Or, they are cherry picking what Jesus says is true or not true, taking it upon themselves to selectively interpret Christ with their own limited and confused “wisdom”. The Church that Jesus founded as always taught the truth of what Jesus said. And only in the Catholic Church (and those in communion with her) can one partake in the real Body and Blood of Christ.